The lease purchase is an alternative way to buy a home, and is especially helpful if the buyer is unable to finance a home immediately, but would like to have the option of buying the home in the future. As an investor, you are not facing more risk by investing in lease purchasing than you would by investing in traditional real estate, and you will most likely be able to close more deals than other real estate investors. Buying a home through lease purchase is a home rental lease that gives you the option of purchasing the property at a future date, during the term of the lease. You are required to pay a deposit upfront, and sign a rental lease contract for 1 to 3 years. During this period of time you will have the option of buying the home, which cannot be sold by the owner to another party. During the rental period, should you decide to buy the home, the initial deposit and part of the amount that you paid as rent will count towards the down payment. If you decide not to buy the home, the initial deposit and the rent that you paid over the years will be kept by the owner. The seller has a few distinct advantages by giving buyers the option of lease purchasing. The home will be listed for sale and for rent, which will attract more potential buyers. You will most likely receive your asking price for your home because of the delayed sale and more variables that can be negotiated. Knowing that they might buy your property in the near future, your tenant will take better care of your home, and may even make improvements. Last, but not least, the deposit that the buyer will make can help you avoid foreclosure, catch up on your payments, and increase your credit score. Buyers who use lease purchasing have the advantage of not throwing money away by paying rent like in a traditional renting situation. Part of the money that goes towards paying the monthly rent will be used as down payment if you decide to purchase the home. Also, lease purchasing is a great option for home buyers with less than perfect credit, but has significant funds available. Investors are able to control a home in order to generate profit from renting it out to a 3rd party. As an investor, you won’t need a large amount of money to make a lease purchase, as opposed to traditional real estate investing. A lease purchase investor has a few options when investing in a home, such as living in the house or apartment, renting it out for a positive cash flow, or reselling it immediately. In a slow housing market and economy, when a lot of sellers have to sell their homes before going into foreclosure, a lease purchase investor can easily make a profit. Once a contract is signed, the investor is required to pay a deposit that will later be added to the down payment, if they decide to buy the home. The rent is set, and the investor is given the option of purchasing the home before the lease contract expires. The home’s selling price is set and it will not change for the duration of the contract. In order to make a profit, the real estate investor can rent the home to another party for more, or flip it for a quick profit. 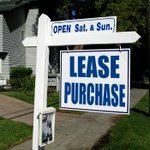 Normally, lease purchasing is advantageous for both the seller and the investor. While the buyer makes a profit, the home owner will manage to pay their mortgage with the rent money that they receive from the investor, or even sell their home for a good price. Sometimes the deal doesn’t work out as expected, or the housing market takes a turn for the worse, in which case the investment won’t be profitable anymore. The good news is that, by using lease purchasing instead of a traditional real estate investment, the necessary capital won’t be that large, so you won’t be losing tens of thousands of dollars. Depending on the state of the housing market, a lease purchase can be a profitable investment. Lease purchase investing can be profitable for investors and play an important role for tenants in the journey to becoming a home owner, but, like any real estate investment, it features plenty of risk, and should not be done without having proper knowledge of the process.